Banned Books Week 2015 is coming up (Sept. 27-Oct. 3). Every year I create a display at my library to celebrate our Freedom to Read. I try to get the display up early each year, and this year was no different. So last week I proudly set up my display in the hour before we opened to the public. I was proud of this year’s display. 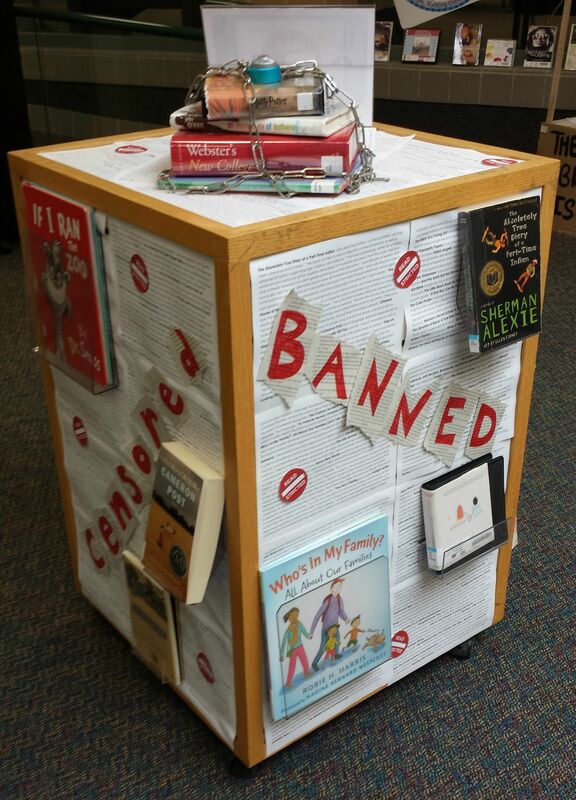 I decided to plaster the display cube with the titles of banned books over the years and the reasons for why they were challenged. Then I wrote Banned, Challenged, Censored, and Restricted on the four sides of the cube in red Sharpie. 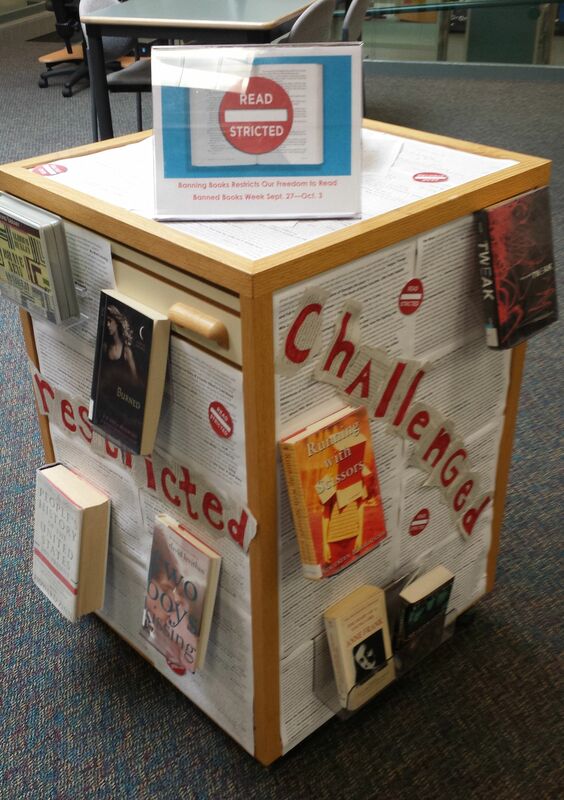 I then chained up the books on the top of the display, and filled in the rest of the display cube with banned books. My display was up for less than 48 hours when a patron complained to my manager about the display. The patron felt the books displayed and the content written on the display were inappropriate for a public library, and didn’t understand why we would have such materials in the library to begin with. I told my manage that all the material written on the display came from the American Library Associations Banned Books Week page, and the majority of the books on the display are award winners and classics. I think the patron missed the point of the display, since she wanted the books removed (specifically Two Boys Kissing, which I adore). However, I do think the incident highlighted the importance of protecting our Freedom to Read, and how important it is to create displays and host programs that garner discussion on why it isn’t right for one person to decide what is appropriate for every other person to read. Feel free to censor yourself, but please don’t try to censor me. 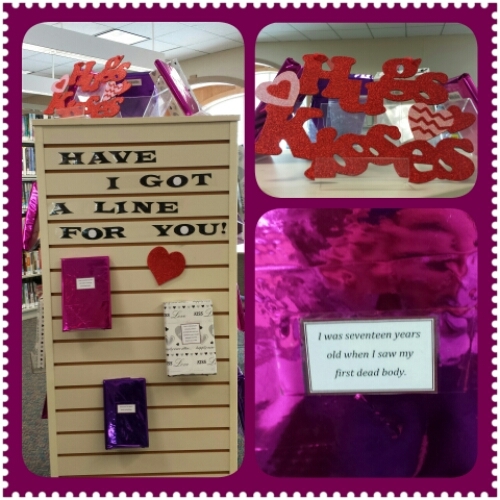 February’s Blind Date with a Book Display in honor of Valentine’s Day. All books were wrapped in paper to disguise the title. The first line of the book was printed on the front of each. Hopefully patrons will be intrigued by the first line and pick up something they wouldn’t normally read. Who visits this blog anyway?